The EIT's network of highly dynamic Innovation Hubs enable national and cross-border EU collaboration, and offer the benefits of regional ecosystems, partners’ facilities, factories, and classrooms for joint programmes and projects. The Innovation Hubs focus on developing innovative products, services and training in a specific area of their Innovation Community, taking targeted actions to help overcome key challenges in that field. Each Innovation Community operates with its own management, legal structure and business plan – autonomously designed with the EIT’s support – and has its own clear, measurable objectives to deliver value to its partners and EU citizens. Innovation Hubs constitute the backbone of an Innovation Community and should have a strong management, enabling collaboration within the Hub itself and with partners from other Hubs. There should be an inbuilt simplification agenda to keep overheads and management costs low. An Innovation Community knits together organisations of different sectors, countries and disciplines. Physically, how is this done? The Innovation Hub is an EIT invention – and one of its primary characteristics. Innovation Hubs are the main instrument for managing activities and knowledge flow. Each Innovation Community has regional Innovation Hubs with partners in close proximity, which is essential to facilitate interaction among members of the regional community. Innovation Hubs are the focal point for the Innovation Communities’ activity within these areas of focus. Innovation Hubs build on the existing labs, offices or campuses of some of the Innovation Community’s core partners, which serve as clusters for a particular region, discipline or task. There they bring together people and teams from across the knowledge triangle for ideation, projects and other initiatives. As part of the Innovation Community’s strategy, which fundamentally includes synergies with other initiatives, the innovation capacity and potential impact of all Innovation Hubs together must be greater than their individual strengths. They give the Innovation Community critical mass on a European scale, forming a continent-spanning network that enables partners to tap into the best talent, ideas and resources. They also give visibility to the EIT brand and EU support. Each of the current Innovation Communities has chosen an Innovation Hub model best suited to its strategy. However, the management structure of a hub should also conform to principles of good governance, in particular reflecting the diversity in the composition of the partners (ensuring a proper balance within the knowledge triangle), ensuring an open and high-quality decision-making process, and separating the supervisory function from the operations. Some centres have specialties in a particular field or discipline, and others have horizontal skills that can help all partners, but several key functions can be seen across all Innovation Hubs: Connectivity: they provide a physical space for interaction within the local ecosystem. These spaces should attract a wide range of actors from within each Innovation Community and beyond; Knowledge management: they function as points for knowledge exchange (within, between and across Innovation Hubs); Activity management: they act as a centre for many activities. The EIT Climate-KIC Innovation Hub in Germany, headquartered at the EUREF-Campus in Berlin Schöneberg, manages all EIT Climate-KIC activities at local and regional levels. The centre focuses on sustainable city systems, e-mobility, modelling, policy and technology road-mapping, solar energy, water and zero-carbon production. The centre also hosts EIT Climate-KIC’s local business incubator, the Green Garage, which offers working space for up to six start-up companies as well as space for workshops and seminars. 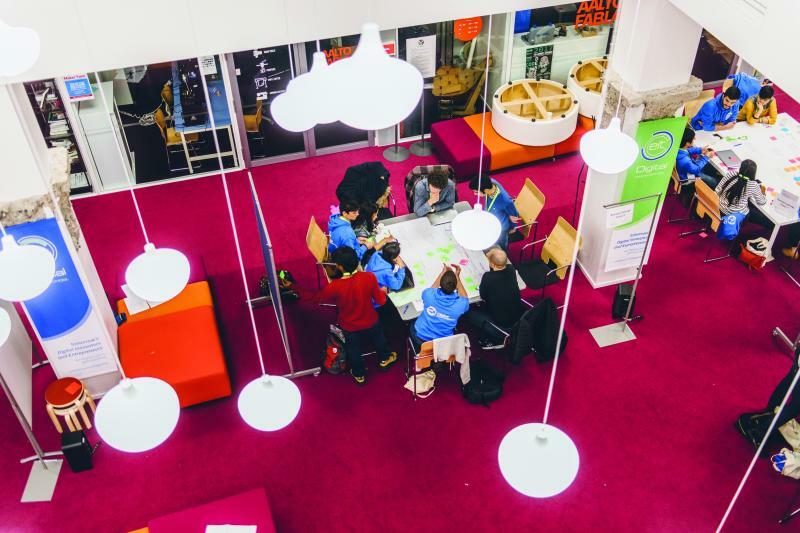 Climate start-ups can get workshop and prototyping space and the support of EIT Climate-KIC’s Acceleration Programme to make their business ideas a reality. The German centre also brings together such partners as Bayer Technology Services, Forschungszentrum Jülich, GFZ, the Potsdam Institute for Climate Impact Research and TU Berlin, and serves as a local hub for EIT ClimateKIC’s wider pan-European partner network. The EIT Digital Innovation Hub in Italy, headquartered at the Povo Scientific and Technological Centre in Trento, focuses on leveraging digital technologies to help improve quality of life. Located at the core of the Trentino Region, an area rich in communications infrastructures and bristling with innovative companies, the centre unites the leading digital players in Italy. Its core partners are Engineering, Telecom Italia and TrentoRISE, while affiliated partners have activities all over Italy (CNR-National Research Council) and have labs, connected to the Innovation Hub, in Lombardy (Politecnico of Milan), Piedmont (Politecnico of Turin), Emilia Romagna (Alma Mater Studiorum – Università di Bologna) and Tuscany (Scuola Superiore Sant’Anna). Affiliated industrial partners include CFR (FIAT Research Centre), Cooperazione Trentina, PosteItaliane, Reply and ST Microelectronics. The EIT InnoEnergy Innovation Hub in Sweden, headquartered in Stockholm, is set up with Kungliga Tekniska Högskolan (KTH), Uppsala University, ABB, and Vattenfall as shareholders. It integrates an additional 30+ partners from industry, research, and education, and offers the Swedish innovation community access to 10 different sustainable energy topics such as renewable energies or energy efficiency. At the same time, it coordinates EIT InnoEnergy’s expertise in the field of smart grids and storage. EIT InnoEnergy Sweden also delivers the European educational offers (e.g., while the EIT InnoEnergy PhD School is a Europe-wide programme, its six tracks are implemented locally, one of them in Sweden). Finally, this Innovation Hub serves as the Swedish entry point to the EIT InnoEnergy Highway, a European incubator specialising in sustainable energy.